Christa Dichgans is a German painter who has developed her own private picture universe made up of everyday objects. Born in 1940 in Berlin, she graduated in 1965 from the Berlin Academy of Arts under Fred Thieler, a representative of Art Informel. 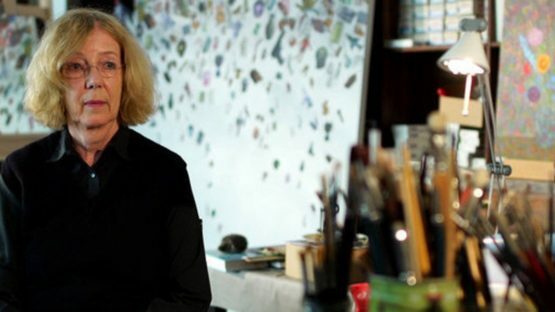 In 1966 Dichgans received a scholarship from the German National Academic Foundation and moved to New York with her first husband, artist Karl Horst Hödicke, and their son. 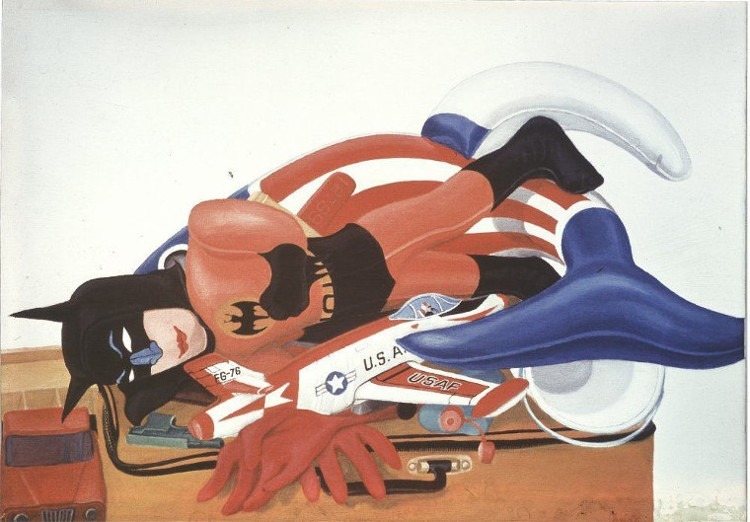 Although pop art was already passé, they met many pop artists there and developed relations with American art dealers. During her one year-long stay in New York, she made twenty pictures. In 1966, her former husband received a scholarship for Rome, so they moved to Italy. Christa Dichgans’ paintings reflect the shifting themes and motifs that have occupied her personal life at various times: toys appeared in paintings after the birth of her son in 1963, encounters with New York Pop artists later that decade led to traces of Pop in her own art, and a stint at a Florentine villa in the 1970s inspired the inclusion of local influences, from food to Classical sculpture. In 1980 Christa finished a big painting of New York. It was a painted collage of the city, which she worked on for more than a year. From 1984 to 1988, the artist worked as Georg Baselitz’s assistant at the Hochschule der Künste, Berlin, Germany. At that time, she met the German artist A.R. Penck and changed her artistic approach: more symbolic collage paintings characterized that period. Yet throughout her work, Dichgans has described the fundamental paradox that has always been the subject of her fascination: the shock of the unknown in the familiar, the surreal quality of everyday life. One of her well-known recent series of paintings are the map paintings based on the impressions Christa Dichgans collected on a journey around the world. They combine the artist’s familiar motif repertoire with the new and unknown of other cultures. 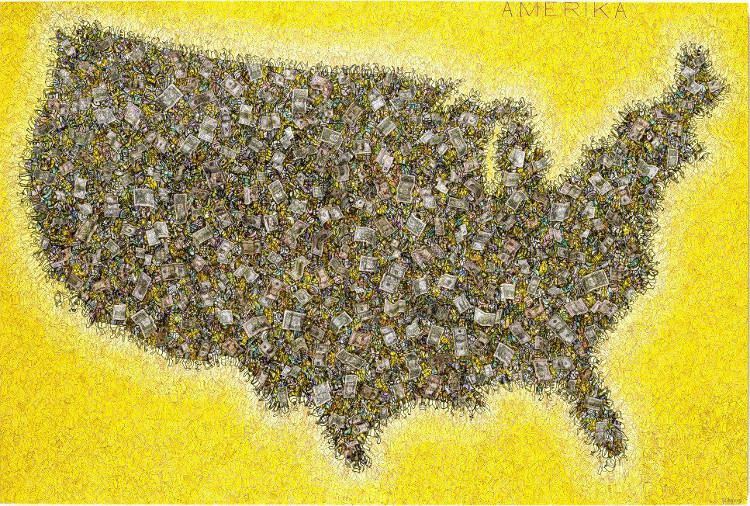 In complex collage paintings like Indien, Amerika or Peru, Dichgans presented maps of these places, filling them with imagery representing the early civilizations that lived there. Gods and saints, masks and individuals form the respective continents, often embedded in backgrounds in which patterns of her familiar bag, coat or spectacle motifs scintillate. In her current work, Christa Dichgans has returned to the composition and method of her complex and detailed Eighties’ image worlds, but her new paintings nonetheless point in a different direction: they diagnose the familiar in the unknown. Christa Dichgans’s has two publications Postskriptum and King Kong Kisses. Postskriptum was published in 2009 by Contemporary Fine Arts, Berlin, and is composed of 40 Christmas postcards of Pop artist, which she signed and dedicated to her husband artist Rudolf Springer. Her first publication King Kong Kisses was realized in 2006. Christa Dichgans lives and works between Berlin, Germany and La Haute Carpénée in Southern France.